The Gose has been making a small comeback as of late with plenty of breweries throwing their hat into the ring in an attempt to craft the best example of the style. 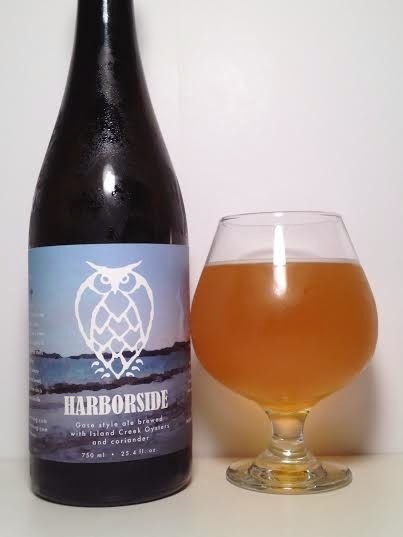 Night Shift Harborside takes the classic Gose recipe and adds the twist of Island Creek Oysters from Duxbury, MA. Pours a bright, hazy, golden yellow with plenty of carbonation. Produces a fizzy, white head that goes away quickly much like soda. The smell is reminiscent of the ocean with hints of sea salt and those oysters. Some sour lemon is there as well, but this smells like low tide at the beach. My initial reaction on the taste was a mouth-puckering lemon tartness combined with an oceanic sea salt that is accentuated by the raw seafood addition of the oysters. When you think lemon taste, you most commonly think of an acidic feel, but in this case it is just tart like a sour candy. The ocean water saltiness isn't unpleasant and it adds to the well-balanced sour flavor. There are no hops to speak of in this beer as oysters and salt appear to be dominant, but in a style such as Gose, it isn't intended to be hop-forward. As it warms up, the oysters are more prominent. They do leave a noticeable aftertaste which is disappointing. Hours after I drank this I was still left with a residual oyster taste. With a light body and 5.10% abv, this is designed to be very sessionable. Harborside can taste like a salty, lemon bomb at times and it would be drinker-friendly if not for such a strong oyster presence. Night Shift Harborside has delivered an interesting rendition of the Gose. The end result is a crisp lemony tartness that can be washed away by raw oysters. An acquired taste for sure.